You can read the Prologue and Chapter 1 online now! 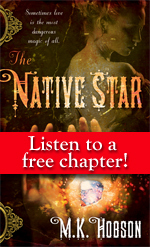 Check back on Friday for an exclusive audio chapter read by M.K. Hobson! Mrs. Jorgensen ran the whores out of a big square building that had once been butter-yellow but had weathered to the color of chicken fat left out on a plate. The place was built sturdy, of white pine and fir, and had fine scrollwork supporting the eaves. The windows were covered with stretched oilpaper, ripped in places. At night, behind the oilpaper, shadows moved in the light of kerosene lamps. Some of the shadows had horns, some did not. The building had three floors. The saloon was on the ground level, and above it there were two floors of small rooms where the girls worked. It was in the room on the east corner of the top floor that the demon prince Methe Pyrtrogo was shot dead. It was past midnight on a Saturday, a hot night after a day when the thermometer outside Jowett’s General Supply had risen to a hundred and three. The hot thick dark air was split by a sound like branches being snapped. Two cracks. No one downstairs heard the sounds. Miners from the Baby Boy and the Independence and the May Queen had gotten their monthly envelopes that day. There was every kind of miner in the dance hall that night–alive and undead, Indian and white, human and demon. The noise they made was deafening. Then Minnie, a young whore with yellow hair, came stumbling down the stairs. She was splattered with black blood, a great deal of it, all over her face and the front of her dress. Robert C. (Bob) Eccles is a radio news reporter and anchor who has narrated stories for Pseudopod, PodCastle, Transmissions From Beyond, Cast Macabre and Every Day Fiction. He also enjoys writing short stories, mostly horror and sci-fi. He”s a member of the Horror Writers Association, the Great Lakes Association of Horror Writers and The Fictioneers. Tiny Terrors, his collection of 67 mostly very short horror stories, is available in the Kindle store at Amazon.